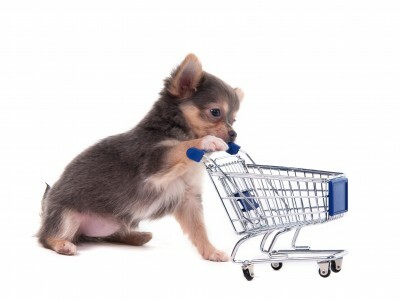 Need a puppy dog supplies list for that shopping spree you're planning? This is the fun part of getting a new puppy, but also a costly activity. We thought we’d help by giving you a ready prepared dog supply checklist. I often wonder why more people don’t give their friends a puppy or dog shower. Wouldn’t that help heal the bank account? There is so much to prepare, but having the essentials right from the start helps the transition to new puppy parenthood smooth. Before the licking, yelping, and puppy kisses take over your life, here is the list of puppy dog supplies we prepared to help make those first few days a success. There are plenty of age-appropriate and size-recommended dog chew toys on the market. Remember small dogs have small mouths, so forget those large balls and opt for a smaller version of a tennis ball. If you want to begin training, you will need Dog treats to help make it easier. “If you want to,” suggests you have a choice, and that is really not the case. Training now-a-days involves a positive reinforcement approach where dog treats serve as the reinforcement. Because it’s easy to overdo, make sure dog treats provide a tiny bit of flavor, not a meal replacement. Adopting an 8 week old puppy? The puppy might not have been introduced to treats yet, so when shopping, buy only a small bag of tiny mouth size treats. Dogs need a food that is appropriate for their size and developmental stage. Puppy foods are designed to provide adequate nutrition for the rapid growth phase without overdoing it on the calorie count. It is important to continue to feed your dog or puppy the same food that they have been eating, gradually replacing their diet with the food of your choice. No puppy dog supplies list would be complete without bowls that can be easily washed and sanitized. Bowls made from stainless steel or ceramic make the best choice for food and water. Many people with small breed dogs prefer to use water bottles rather than bowls. Water bottles such as those sold for use with rabbits or guinea pigs work very well. For those who are planning to serve kibble at lib might want to consider an automatic feeder. Unfortunately, I have not been able to find any automatic feeders that are stainless or ceramic. Plastic water bottles have the same effect as plastic food containers and need to be replaced frequently. A word of warning: If you choose to use a water bottle, buy a good bottle brush and give the bottle a good scrubbing frequently. If you choose to use a water bottle, buy a good bottle brush and give the bottle a good scrubbing frequently. Dogs need a safe, comfortable, clean spot to sleep, even if you insist your small breed dog share your pillow. Many owners find crate training an indispensable tool in the house training process, and this answers the question of where to encourage your dog’s slumber spot. All dogs should be able to stand up, turn around and stretch out comfortably in a crate. Anyone with a canine interior decorator? My dogs love to rearrange their beds, drag them out of the crates and find just the right spot for them. I solved part of the problem by placing them on thick throw rugs that made it harder for them to slide the bed around. Enzymatic cleaners, which break down proteins such as the ones found in urine, are very helpful for those house training incidences. Cleansers designated “pet safe” are a good way to ensure your tiny dog won’t get sick even if they try to sample the cleaner. Stock up on paper towels, unless you love to do laundry. But, a word of warning, small puppies love to play with paper—any kind of paper—paper towels, toilet paper, Kleenex, newspaper, magazines, books, etc. so don’t leave your cleaning supplies within easy reach of those tiny paws. While purchasing those enzymatic cleaners, decide whether you will need pee pads. If you plan to confine your puppy or dog while you work, you might want to consider what would happen if they must relieve themselves before you return. Traditionally, newspaper was the product of choice, but pee pads actually work better. They are scented to encourage use and have a plastic backing to prevent accidents from seeping through. Don’t forget yard clean up. If you plan on walking your dog outdoors, you will need small poop bags and/or a pooper scooper. We have found that the two-part scoops work better than the hinged versions. Those Scoopers with a rake work better on grass, and the flat-edge pusher varieties are better for cement surfaces. This page goes into more depth about house breaking must-haves. Puppies love to chew paper, shred paper or otherwise destroy paper. Pee-pads are made of paper! While cleaning supplies are fresh on our mind, don’t forget keeping that tiny fur ball clean as well. Here we’re talking about shampoos and conditioners, combs, brushes, nail clippers, tooth brush & paste, and any extras that might appeal to you. A harness works especially well for small breed dogs and should be used for initial leash training. You will still need a collar because you won’t be able to add tags to a harness. Your puppy will receive a rabies tag from your veterinarian, but there are other ways to assure your dog can be identified in the case of an emergency. A dog tag can be purchased inexpensively that includes the dog’s name, your name and telephone number. The best way to assure your dog is identifiable is through micro chipping.